Sure Win Video Slot Review - Casino Answers! 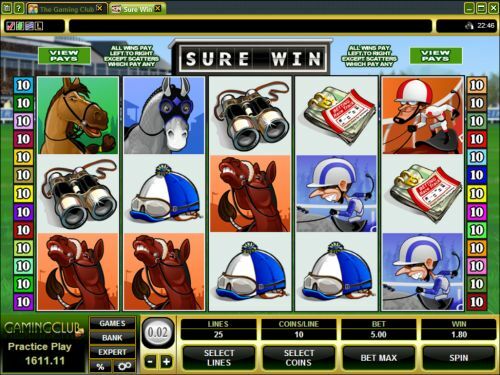 Sure Win is a 5-reel, 25-line video slot developed by Microgaming, featuring a wild multiplier symbol, scatter wins, a gamble feature and a free spins feature with multipliers. You can play the Sure Win video slot at Bovada. The Sure Win casino game is a penny slot. Coin values on the Sure Win slot machine are $0.01, $0.02, $0.05, $0.10, $0.20 and $0.25. You can select up to 25 lines at 10 coins per line. The maximum total bet that you can make on the Sure Win video slot is $62.50 per spin. Sure Win has a decent betting range that is suitable for most online slots players. To play the Sure Win video slot, select your bet and hit “Spin.” To play all 25 lines at 10 coins per line, use the “Bet Max” button. The top-paying symbol on the Sure Win slot game is the Sure Win symbol. If you land 5 Sure Win symbols on a selected payline, you will win the 7000 coin top jackpot. The Sure Win symbol is a wild multiplier and will substitute for all non-scatter symbols. It will also triple your win on any winning combination it completes. The Bookie symbol is the scatter symbol on the Sure Win video slot. You can get a scatter win of up to 100X your total bet by hitting two or more Scattered Bookie symbols. By hitting three or more Scattered Bookie symbols, you can win 12 free spins at a 4X multiplier, 16 free spins at a 3X multiplier or 24 free spins at a 2X multiplier. The free spins feature cannot be re-triggered. All bets and lines played are the same as the game that started the feature. You can get a sure win from this free spins feature at Bovada! Payouts are displayed on the Paytable. All wins are multiplied by the bet per line, except for scatters. All wins pay left to right, except for scatters (which pay any). Only the highest win is paid per selected line. Scatter wins are added to payline wins. Scatter wins are multiplied by the total bet. Sure Win has an autoplay feature with advanced settings. To use the autoplay mode on the Sure Win online slot machine, you must hit the “Expert” button. You can now play 5 or 10 autoplay spins. For advanced settings, hit the “AutoPlay” button and you can now play 5, 10, 25, 50, 100, 250 or 500 autoplay spins and stop autoplay if a win exceeds or equals $100, $500, $1000, $5000 or $9999. Autoplay will stop on any feature contained in the game. You can stop autoplay at any time on the Sure Win slot game. 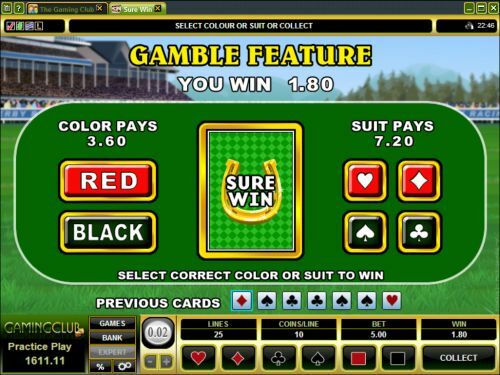 Big-time punters will surely love the Sure Win horseracing video slot. There’s a good top payout, a free spins feature, a wild multiplier with tripled winnings and a gamble feature to win even more! You can play the Sure Win video slot at Bovada. Where can I play a free flash game of the Sure Win fruit machine? You can play the Sure Win video slot for free or real money in your browser at Bovada. If you have any issues with the flash casino, update your version of Adobe Flash Player. Where can I play more horseracing themed video slots? If you’re looking for horseracing slots, football slots, rugby slots or whatever kind of sport you wish, please refer to our complete list of sports-themed slots for all of the different sports available in slot machine form. Can American players play the Sure Win slot game for real money? No, American players or USA-based players cannot play Sure Win for real money. However, you can play the A Day at the Derby video slot at Rival-powered online casinos such as Bovada.